6116 is LEGO's DesignID for this brick in Polycarbonate. Click on a colored part below to see the Sets and MOCs that use part 3941 Brick Round 2 x 2 with Axle Hole in that color. You can find an overview of all LEGO Colors here. What is rebrickable's thoughts on this? There are functional differences. I have some spare old round 2x2 bricks with a mold number 1 on them. If you try to force an antenna or other bar into the axle hole, you might succeed, but it will probably break the bar trying to get it out. This happens with most of the ones that have 3941. It is obvious from all the different mold numbers I have, that there was a lot of experimenting before they came up with one that could be used with a bar easily. I believe that is what lead to the change of part number to 6143. For the most part I have no way of determining which sets had which round bricks. My son played with and mixed up parts from most of the older sets. If you want to pursue this, I can dig around and try to find some sets that have been kept more intact. I think the best thing, as [per usual] there's no good record, is to do some mould variant pictures, and part notes that state 3941 is the earliest [with high grip]. Unless we find good information on the changeover from 3941, there's not a lot else to do. To my mind [which is tiny] there doesn't seem much point making a part variant, when the difference is so minor, and so undocumented. The DesignID change was for the axlehole, you're right, the other changes to the base weren't substantial enough to require a new DesignID, so were probably for clutch strength. Anyone else have any ideas? Sheo, you're the variant master, thoughts? Yeah, 6116, 6143 and 3941 are all interchangeable. 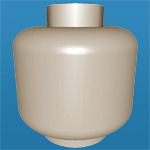 LDD is usually one iteration behind for new design bricks. You can submit a bug report for this to the LDD team [or let Superkalle know on eurobricks], but they will eventually deprecate older design numbers. Rebrickable uses this part number and maps the others to it, as there is no difference to the bricks, it's just the centre axlehole was redesigned AFAIK.